Spokane Central Market as it's envisioned from Wall Street. By sometime later this summer, downtown Spokane will be home to a trendy new food hall. 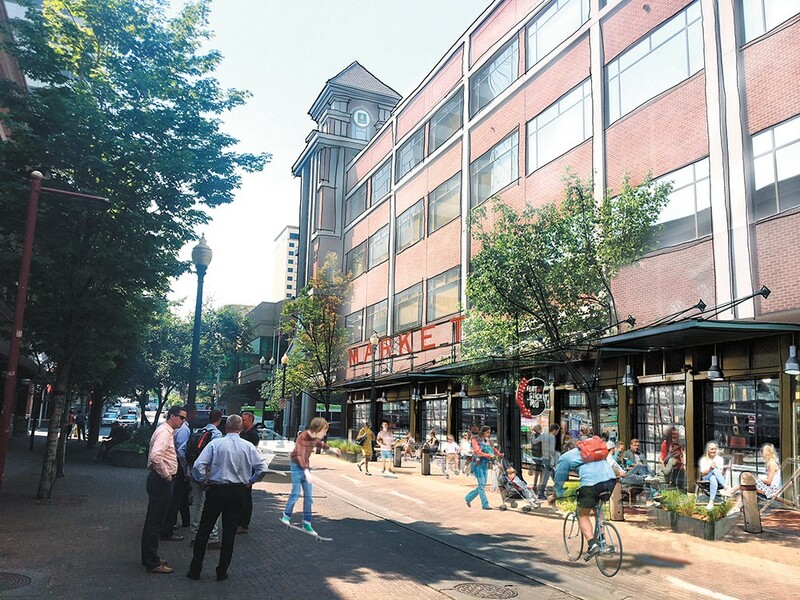 Called the Spokane Central Market, the space in a building at the corner of Wall and Riverside will be similar in nature to the Saranac Commons on the east end of downtown that's home to a brewery, bakery, café, biscuit counter and a few other non-food retailers. Spokane Central Market, however, will be significantly larger in size, totaling 20,000 square feet and with enough space to house between 12 and 15 tenants. Similar to a food court, seating and other public areas inside the space will be shared by all of the market's tenants. Another regional comparison is the Pine Street Market in downtown Portland, which opened in 2016 and is home to nine food vendors, including a Korean barbecue, burger joint, juice bar and Japanese ramen chain. The same developer of that project, Seattle-based InterUrban Development, is building Spokane Central Market. The food hall is taking over a historic space once home to the Crescent department store that was most recently an Umpqua Bank branch. Demolition to gut the space is almost complete, and the project's developers are already seeking potential tenants by reaching out to local business owners who they feel would be a good fit for the concept. They're seeking to fill the market with a non-overlapping mix of complementary eateries, as done in their Portland venue. "It's a really great synergy, and it's going to be active," says Steve DeWalt, an associate with InterUrban. "Even if your space doesn't have people sitting there at that moment, the rest is going to feel busy. People coming to markets like this are ready to discover something and walk around, and explore and do something different." The downtown food hall project is a partnership between Denver-based Confluent Development and InterUrban, the latter of which is owned by Rob Brewster, who developed the Montvale Hotel. InterUrban is currently working on another local project to revive the historic McKinley School building (117 N. Napa) in East Central Spokane into a mixed-used space with first-level restaurants, a brewery or distillery and upper-floor office space. Recently, InterUrban also announced plans to convert a historic former grocery store building in the South Perry District into a neighborhood cafe, set to open later this year. InterUrban can't say yet who they've been in talks with to move into Spokane Central Market, but DeWalt says those announcements will be made as the project progresses. InterUrban's goal is to have the market open by this summer. The original print version of this article was headlined "To Market"